Olentangy Orange’s Sam Till (18) celebrates with Matthew Wolf after scoring a run during Friday’s OCC showdown against host Olentangy Liberty. 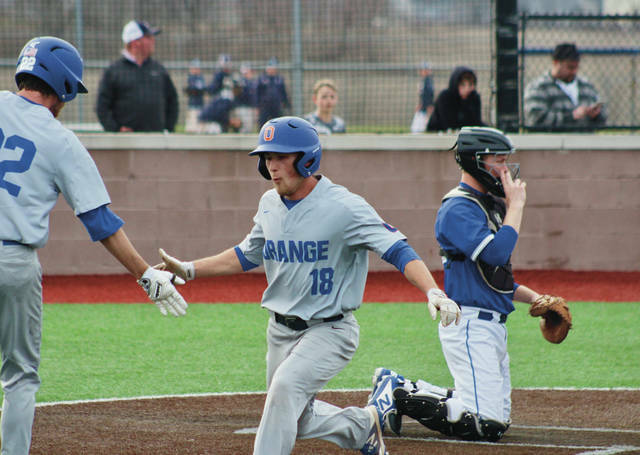 POWELL – First-year coach Tom Marker didn’t want to overstate his Olentangy Orange baseball team’s 2-0 victory at rival Olentangy Liberty Friday to open OCC-Buckeye play. Josh Laisure had a lot of big moments in the win. The sophomore right-hander tossed a complete-game shutout, allowing four hits and four walks with three strikeouts. He even provided the Pioneers’ go-head RBI on an infield hit in the sixth inning to break the scoreless tie. Marker credited a pair of seniors for Laisure’s success. Laisure pitched out of two bases-loaded jams to keep the Patriots off the board. Andrew Rodriguez worked a two-out walk in the third inning, Mitchell Okuley followed with a single – Liberty’s first hit of the game – and Corbin Parrish reached on an infield hit to load the bases. But Laisure coaxed a pop-fly to third to end the threat. Craig Lutwen opened the fifth with a walk and moved to second on a Jack Metzger sacrifice bunt. Rodriguez followed with a single – one of his two hits – and Parrish was hit by a pitch with two outs to load them up again for the Patriots (5-1, 0-1). Justin Nelson sent a sharp liner back to the mound that Laisure knocked down, collected and threw to first to end the inning. Metzger was almost as good on the mound for the Patriots. He allowed four hits and four walks and struck out seven in a complete-game effort on the mound. Metzger, fresh off a final four appearance with the Liberty boys basketball team, was on the mound for the Patriots in their first game in Myrtle Beach, SC. Metzger had the Pioneers reeling in the early stages. He set down 10 out of the first 11 batters, issuing only a walk during that span. Matthew Wolfe was hit by a pitch and Ross broke up the no-hitter with a single. But Metzger coaxed a groundball double play to end the threat. Zane Lattig opened the fifth with a single, but was left stranded at third when Metzger got a strikeout to end the inning. Caden Konczak singled and Braden Riley worked a walk to start the sixth. Wolfe sent a deep fly ball to center that was run down by A.J. Rausch and both runners moved up. After a strikeout, Laisure stepped to the plate and sent the first pitch up the middle that was cut by second baseman Michael Atkinson, who didn’t have a play, and the Pioneers took the lead. Atkinson, however, made a perfect throw home to get the trailing runner to end the inning. “It was a little off the end of the bat, but it still got through,” Laisure said. Orange loaded the bases with two outs in the seventh when Sam Till singled, Dayhuff walked and Konczak was hit by a pitch. Riley worked a walk to drive home the insurance run. Liberty, the defending state champion in Division I, had a 13-game winning streak snapped. The Patriots’ last loss was May 19, 2018 in the second to last game of the regular season. The Pioneers (4-3, 1-0) extended their winning streak to four games. Next up, Orange travels to Pickerington Central today for a pair of non-league contests. The Pioneers face the host Tigers at 10 a.m. and then face Thomas Worthington at noon. Liberty is also in action. It hosts Cuyahoga Falls Walsh Jesuit in non-league play today at 11 a.m.